Understanding the workings of the human mind is a valuable skill, one that influences everything from politics to personal relationships. It’s no wonder that psychology ranks as one of the most popular majors for undergraduate study, not just in campus-based programs, but also in the realm of online higher education. Find out more about the options for an online degree in clinical psychology, and how it can open the door to a range of career opportunities. Knowledge of the human mind is a great tool for all facets of life. An online degree in clinical psychology can lead to a career working with both individuals and groups as they work through challenges like substance abuse, depression and learning disabilities. To find a degree program that meets your professional needs, first find one that leads to licensure in your state. Then, research the best schools and programs in your area, starting with our lists. We’ve included the benefits and career paths for a variety of degree levels. Faulkner University offers students a fully online bachelor's degree in clinical psychology. Students typically spend 4 years completing the 121 credits necessary to graduate; 71 credits are in the major and 50 are core courses. A number of minor and certificate choices are available to those who wish to specialize in a particular area. As a Christian school, several required courses cover Christian principles and Bible studies. Graduates go on to work in schools, clinics and hospitals; others continue their education at the master's level. The bureau of labor statistics provides the following data about job growth in the Clinical Psychology industry. As well as the following national median salary data for several different careers in the field of Clinical Psychology. The path to working with patients in a clinical setting is a long one, with each step building on the one before. Here’s an example of how an aspiring clinical psychologist can move from the first spark of interest into a successful clinical practice. Majored in psychology, with a minor in biology. Obtained a master’s degree in health psychology. While working at a local hospital, led weekly support group for patients struggling with depression. Completed an employer-sponsored online Ph.D. program in clinical psychology and became a licensed clinical psychologist. Returned to hospital as senior psychologist on staff and established a clinic to offer counseling to diabetic patients. Students considering online degree programs in clinical psychology should keep in mind the two primary aspects of the discipline—clinical research and clinical practice—and seek a program that thoroughly addresses both through its coursework and internship opportunities. Program content should cover topics such as the theories and principles of clinical psychology, psychological research design, methodology and analysis, and legal and ethical concerns in psychology. As students advance through the degree levels, clinical experience becomes evermore critical. The American Psychological Association (APA), which accredits doctoral programs, discourages students from relying entirely on distance learning, in large part due to the practical experience vital to professional practice. However, the APA does not put a fixed limit on how many credit hours earned toward a doctorate can be obtained through online coursework. Prospective students should note that many master’s and doctoral programs have addressed this concern by either requiring or offering the option of a campus-based residency or internship, which aids students in gaining the clinical research and counseling experience necessary for licensure and job placement. In addition, online learning does offer several advantages—including convenience, flexibility and affordability—for those who may already be employed or have other obligations. In addition, some of the core competencies the APA identifies—information and technology literacy, for example—may be easily acquired through online education. Clinical psychology is the underpinning of many specialty areas in psychology. 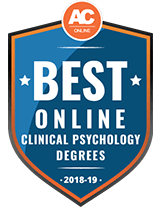 Students can pursue an online education in clinical psychology even at the baccalaureate level, but typically a specialization in clinical psychology happens at the graduate level. Becoming a fully licensed clinical psychologist requires a doctorate degree, while master’s and bachelor’s programs provide a foundational education along the way. At the undergraduate level, students usually pursue a more general psychology major, although many of the underlying principles of clinical psychology are covered during coursework. A bachelor’s degree in psychology typically entails a four-year course of study that includes 120 credit hours with both general education requirements and specific classes in the major, which may include topics such as developmental psychology, abnormal psychology, social psychology, statistics, and psychological research design. These can be completed through online coursework, and generally campus-based activities or internships are available but not required. Online master’s degrees in clinical psychology come in three forms: Master of Arts (MA), Master of Science (MS), and Master of Professional Studies (MPS). All are designed to be completed in as little as 15 months, with about 30 credit hours of coursework. MS and MPS programs tend to put a greater emphasis on applied clinical skills, as opposed to pure research and theory, but that varies by program. MA and MS programs are more likely to have a thesis requirement, but all three types of degrees should offer internship and independent research opportunities in preparation for a doctorate-level studies in clinical psychology. It should be noted that a master’s degree is not sufficient to attain licensure as a professional clinical psychologist. The certificate of advanced study is a post-master’s degree option designed for students who want to pursue vocational training in psychology without investing the time it takes to earn a doctorate. While this limits licensing and job options, it can provide useful training in addiction and substance abuse counseling, marriage and family therapy, and various kinds of psychological research. Certificate of advanced study programs are designed to be completed in a year or less. The two doctoral-level degrees in clinical psychology are the Ph.D. (doctor of philosophy) and the Psy.D. (doctor of psychology). The former is based on the traditional research university model for a doctorate, one that emphasizes clinical psychological research and requires a dissertation. The latter grew out of scientist-practitioner model and is more tightly focused on interaction with patients in a clinical practice setting. Both take about five to seven years to complete, and should prepare students to become licensed to practice in any professional setting, from one-on-one counseling to clinical research to teaching at the college level. Most APA-accredited online doctoral degrees are low-residency programs that require some form of intensive on-campus training, as well as a supervised internship or practicum. Investigates cognitive-behavioral approaches to therapy, based on models of human behavior, that are used to treat psychological disorders. Examples would be dialectical behavior therapy and acceptance and commitment therapy. Covers neuroanatomy and the effect of neurobiology on psychological and behavioral disorders. Explores current ethical and legal issues faced by practicing clinical psychologists, and how to apply standards in various settings, including assessment of patients, supervision of other psychologists, teaching and research. Explores various theories employed in psychological measurement, such as classical test theory and item response theory; the mathematical models that serve as foundations for such theories; and their reliability and validity. Examines methods used to collect, organize and analyze data; using statistical methods to design experiments; and developing presentations and reports. Review the program’s overall content. Look at overall course requirements and selection, as well as internship and research opportunities. Check the program’s structure. Online programs are often timed differently than their on-campus counterparts, so be sure that start dates fit your schedule, and that it’s possible to complete any in-person requirements. Determine the program’s admissions requirements. Some schools have minimum GPA requirements, and graduate programs may have course prerequisites. Take the GRE, if necessary. Some graduate programs require the Graduate Record Examination. The GRE psychology subject test may also be necessary. Collect Letters of Recommendation. Many programs ask for letters from former professors or work colleagues to demonstrate a student’s capabilities and interest. Check Accreditation Status. The gold standard for accreditation in clinical psychology is the APA, although this only applies to doctoral programs. Undergraduate colleges and universities are accredited by regional organizations, and several groups offer accreditation to master’s degree programs. (Learn more about accreditation below). Investigate support services. Academic advising, tutoring, and technical support are some of the services online students may need. It’s hard to overstate the importance of accreditation, particularly in the realm of online education. Accreditation serves as a formal system for schools and programs to be independently evaluated based on established standards, and ensures that a program has been thoroughly vetted and offers solid educational content. The U.S. Department of Education maintains a database of regional and national institutional accrediting agencies. These include the six regional organizations that accredit most of the undergraduate programs in the United States. 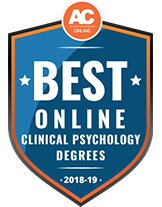 At the master’s level, the primary organization for accreditation of clinical psychology programs is the Masters in Psychology Accreditation Council, which maintains an online database of accredited schools and programs. Accreditation is particularly important at the doctoral level, because it can be a deciding factor in whether or not a graduate qualifies for state licensure to practice as a professional psychologist. The APA is the primary organization that oversees the accrediting of Ph.D. and Psy.D. programs in clinical psychology, through its Commission on Accreditation. While the APA may accredit programs that offer a combination of online an in-person education, students should be aware it does not accredit those that are offered “substantially or completely” online. Online programs in clinical psychology, particularly at the graduate level, often have rolling admissions policies, offering several start dates throughout the year. With that in mind, students should prepare a timeline of tasks that need to be accomplished in advance of the program’s start. Below is a sample schedule for enrollment in a graduate program. Conduct academic research Seek out research opportunities at the undergraduate level. Forging relationships with faculty members in the psychology department can lead to opportunities to work as a research assistant or a departmental aide, which admissions boards often look favorably upon. Gain hands-on experience Volunteering or interning at a community center, mental health clinic, or another social services setting can set applicants apart, and give students an idea of their future career opportunities. Join a psychology student organization Psi Chi is an international psychology honor society for undergraduates, with chapters on many college campuses, and Psi Beta is a similar society for community and junior college students. A degree in clinical psychology can lead to any number of career paths. Licensed clinical psychologists may work as counselors with individuals, families, or groups, addressing specific psychological needs. In general, these professionals are well-positioned to enter specialty fields such as health psychology, school psychology, and industrial-organizational psychology. They may also focus on the research side of the profession, using the tools of behavioral science and psychology to forge new theories, therapies, and programs. The U.S. Bureau of Labor Statistics projects a robust increase of 20 percent in the demand for clinical, counseling, and school psychologists through 2024, which should add 30,500 jobs to the existing 155,300 employed as of May 2014. Licensing requirements for clinical psychologists vary by state, but in general it is necessary to hold a doctoral degree from an accredited program, as well as have one to two years of supervised clinical experience (between 1,500 and 6,000 hours), some of which is generally completed as part of the doctoral degree. Those qualifications allow candidates to take the licensure exam administered by the Association of State and Provincial Psychology Boards. Students who have obtained a master’s degree in clinical psychology, but not completed a doctoral program, may also choose to become a licensed professional counselor (LPC), sometimes designated as a licensed clinical professional counselor (LCPC), or a licensed mental health counselor (LMHC). Candidates must pass either the National Counselor Examination or the National Clinical Mental Health Counseling Examination. A doctoral program including an internship, at least one year of postdoctoral experience, and self-identification as a clinical psychologist are required for this certification. Applicants must hold a doctoral degree, have completed an internship substantially focused on child or adolescent populations, and have completed three years of postdoctoral experience. Applicants must hold a doctoral degree, have completed an internship requirement, and fulfilled one to three years of related experience. Candidates must have a doctoral degree with an internship requirement, be licensed, and demonstrate experience in eight core areas of didactics, including clinical neurology and psychopathology. Students are armed with the skills and knowledge to work with students at the K-12 level, as clinical counselors, program coordinators, and educational policy administrators. Prepares graduate students to begin careers as counselors, analysts, and expert advisers, working with police, lawyers, victims, and perpetrators in the criminal justice system. Graduates of these programs focus on the problems common to children and adolescents, using assessment and treatment methods specific to younger ages. The American Psychological Association of Graduate Students is a member group that provides resources and networking opportunities for students studying psychology. The Society of Clinical Child & Adolescent Psychology is a division of the APA that provides resources and free membership to psychology students. The Society of Clinical Psychology is the APA organization devoted to clinical psychology; the website includes areas devoted to the clinical psychology of women, the clinical psychology of ethnic minorities, graduate students and early career psychologists, and other resources. The American Academy of Clinical Psychology is part of the larger ABPP organization, which serves the interests and needs of clinical psychologists.